The Orthodox Church in America (OCA) is an autocephalous Eastern Orthodox church in North America. The The OCA is a member of the Standing Conference of Orthodox Bishops in America (SCOBA). The supreme canonical authority of the OCA is the Holy Synod of Bishops, composed of all the Church's diocesan bishops. The ex officio chairman of the Holy Synod is the metropolitan, currently Metropolitan Tikhon. The Holy Synod meets twice annually, however special sessions can be called either by the metropolitan or at the request at least three diocesan bishops. The primate of the OCA is the metropolitan. He also serves as the bishop of one of the Church's dioceses. With the other bishops of the Church, the metropolitan is considered the first among equals. His official title is "Metropolitan of All-America and Canada." His role is to manage the welfare of the Church, and to act as its representative with other Orthodox Churches, religious organizations, and secular authorities. The metropolitan is elected, when necessary, by the Holy Synod at an All-American Council (a general council of OCA clergy and laity). There are no age or term limits for the metropolitan, and he may retire at any time, but usually does so only for health-related reasons. The OCA is currently composed of twelve geographic and three ethnic dioceses. The diocese is the basic church body that comprises all the parishes of a determined geographical area. It is governed by the Diocesan Bishop, with the assistance of a Diocesan Assembly and a Diocesan Council. The boundaries of the ethnic dioceses overlap those of certain geographic ones. These dioceses are the result of smaller ethnic jurisdictions joining the OCA at some point in its history, usually after having broken from other bodies. Dioceses are established by the Holy Synod whenever needed, and the Synod may also modify the boundaries of an existing diocese. According to the Statute of the Orthodox Church in America, the All-American Council is the "highest legislative and administrative authority within the Church". The Council is composed roughly of the Metropolitan, all bishops, priests, and selected lay delegates. The purpose of the All-American Council is to discuss and vote on Church matters. When necessary, the Council has also elected new metropolitans. The period between All-American Councils is set at three years, although this is not always the case. The first thirteen Councils (held from 1907–1970) are referred to as All-American Sobors, reflecting the American Church's jurisdictional ties to the Russian Orthodox Church. The fourteenth Sobor (held 1970) is jointly known as the 1st All-American Council, reflecting the autocephalous status of the OCA. The 14th All-American Council was held in Toronto in July 2005, with the 15th tentatively scheduled for 2008. Metropolitan Tikhon (secular name Marc R. Mollard; July 15, 1966, Boston, Massachusetts) is the Primate of the Orthodox Church in America, the former ruling bishop of Philadelphia and Eastern Pennsylvania. He was elected as Metropolitan of the Orthodox Church in America on November 13, 2012 at the 17th All-American Council in Parma, Ohio. The Metropolitan Council is the permanent executive body of the Church's administration. It is tasked with implementing the decisions of the All-American Council, as well as handling the Church's budgetary concerns. The Council is headed by a chairman (the current Metropolitan), and is composed of the OCA's chancellor, secretary, treasurer, and selected clergy and lay delegates. It usually meets twice per year. The OCA's headquarters are located in Syosset, New York and consists of more than 700 parishes, missions, communities, monasteries and institutions located primarily in the United States and Canada. Additional parishes and missions are located in Mexico and Australia. Membership estimates for the OCA vary, with recent figures ranging from as low 27,169 to as high as 1,064,000. The history of the OCA began with the arrival of eight Russian Orthodox monks at Kodiak Island, Alaska, in 1794. The monks established a mission in Alaska, which became a diocese of the Russian Orthodox Church. The United States purchased Alaska from Russia in 1867. By the late 19th century, the church had grown in other areas of the United States due to the arrival of immigrants from areas of Europe and the Middle East. Most of these immigrants, regardless of nationality or ethnic background, were united under a single North American diocese of the Russian Orthodox Church. By 1917, the American diocese was the largest in the Russian Orthodox Church. It had grown from ten parishes in 1890 to more than 350. Most of the funding for the diocese was provided by Russian Church, via the Imperial Missionary Society. 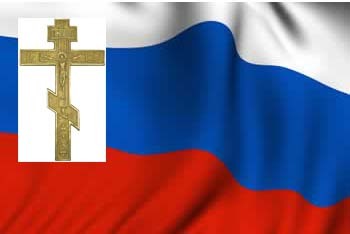 The connections between the American diocese and the Russian Church would be severely compromised by the events of that year. The Russian Revolution of 1917 and the subsequent establishment of the Communist Soviet government ushered in a period of repression for the Russian Orthodox Church. Church property was confiscated, and when Patriarch Tikhon resisted, he was imprisoned from April 1922 until June 1923. On November 20, 1923, Patriarch Tikhon of Moscow directed all Russian Orthodox churches outside of Russia to govern themselves autonomously if they were not able to contact the central administration or if it were disabled. Some Russian Orthodox churches outside Russia took this directive as applying to them as well, and used it as the basis for declarations of autonomy even without the necessary condition of the inability of the central administration to govern them. Ethnic groups within the American diocese began to re-align themselves with other national churches. In 1918, a group of Ukrainians in Canada formed the Ukrainian Greek Orthodox Church in Canada, and in 1922, the Greek Orthodox Archdiocese of America was established. In 1926, the Serbians aligned with the Serbian Orthodox Church. While many ethnic dioceses subsequently placed themselves under the jurisdiction of other Orthodox churches, a large number of Orthodox in America became a self-governing Russian Orthodox Greek Catholic Church in America (known informally as the "Metropolia" - named after Metropolitan Platon) under the leadership of Metropolitan Platon (Rozhdestvensky). On April 10, 1970, The Russian Orthodox Greek Catholic Church in America was granted autocephaly by the Russian Orthodox Church (Patriarch Alexius I and fourteen bishops of the Russian Church's Holy Synod signed the official Tomos of Autocephaly), and was renamed the Orthodox Church in America (OCA). The name change, as well as the granting of autocephaly, was officially accepted at the 14th All-American Sobor (also known as the 1st All-American Council in recognition of the Church's new-found independence) in October 1970. The OCA's autocephaly is not currently recognized by all other autocephalous Orthodox Churches (e.g., the Church of Constantinople). Most of these churches recognize the OCA as canonical and its sacraments as valid, however. Although the autocephaly of the OCA is not universally recognized by all autocephalous Eastern Orthodox churches, it is in full communion with them. Within the past twenty years, the OCA has established more than 220 new parishes. It is a member of the Standing Conference of Orthodox Bishops in America (SCOBA), together with the Greek Orthodox Archdiocese of America, the Antiochian Orthodox Christian Archdiocese of North America (AOCA) and the other member jurisdictions. Serious consideration has been given recently to a possible merger between the OCA and the AOCA. Both groups share a significant common history, in that a Syrian priest, Father Raphael Hawaweeny, was sent by the Moscow Patriarchate in the late 19th century as a missionary to Arabic-speaking Orthodox Christians living in North America. Raphael was ordained a bishop in 1904, and his flock eventually became the AOCA. Bishop Raphael was canonized in March 2000 by the OCA as St. Raphael of Brooklyn. Primate of the OCA is Metropolitan Tichon (Philadelphia and Eastern Pennsylvania), who was elected on November 13, 2012.